A man who fled the country in an attempt to avoid murder charges was recently returned to the U.S. by officials in Spain via international extradition proceedings, according to a report by the Tampa Bay Reporter. The fugitive is facing numerous charges in connection with a wrong-way car accident in 2012, which killed one person and seriously injured two more. One count of DUI manslaughter, one count of vehicular homicide, and additional counts related to DUI and reckless driving apply in the case against him. Though he was arrested at the time, he fled the U.S. and authorities had been searching for him ever since. The man was captured in Spain in August 2016, and officials immediately began processing him for extradition to face the charges back in the U.S. International extradition matters are quite different from the extradition under Florida law. The U.S. Constitution includes the Extradition Clause, which permits the extradition of fugitive between and among the states. International extradition, on the other hand, is granted to the President under the power to handle foreign affairs. In general, extradition treaties govern how countries can seek return of a fugitive as the requesting nation or return the individual as the asylum nation. The U.S. maintains numerous extradition treaties with other countries, including Spain. The U.S. negotiates extradition treaties by looking at the fairness of the other country’s judicial system, among other factors. Each party to the agreement will state certain procedures and conditions that apply in extradition matters, including which offenses that allow for the process. 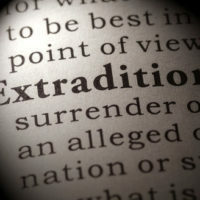 Because international extradition falls under the executive branch, the Office of the President – usually the Secretary of State – will handle extradition requests. He or she may decline to extradite a fugitive for discretionary reasons, such as concerns about humanitarian abuses if the person is returned to the requesting country or foreign policy considerations. The Secretary may also attach certain conditions when granting extradition, such as requiring the requesting nation to ensure that the criminal proceedings carry the same civil rights protections that apply to accused individuals in the U.S. Under some circumstances, the U.S. judiciary may be involved with an extradition request – even if the executive branch would otherwise allow it. The federal courts can dismiss an extradition matter if the offense is not a crime under U.S. law or if returning the fugitive would contravene the Constitution. Extradition proceedings under federal and state law may differ greatly, but you need a strong defense if you’re involved in either type of case. An attorney with experience in criminal cases can explore your options for beating the extradition warrant or reducing the charges, so you need a skilled legal professional on your side. Fort Lauderdale lawyer Kevin J. Kulik has represented clients in various types of warrant cases and will fight for your rights under Florida law. Please contact our office today for a confidential consultation.